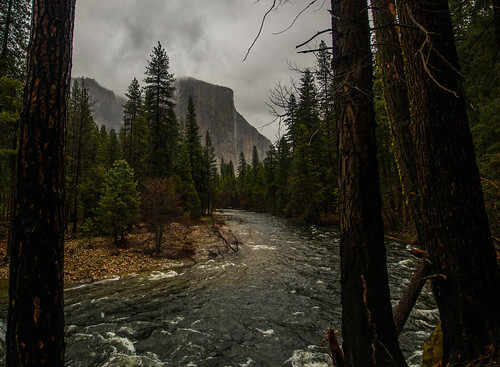 Measuring just under 12 miles in total, the Yosemite Valley Loop Trails follows the park’s old wagon trails, incorporating the main features of the valley in the process. 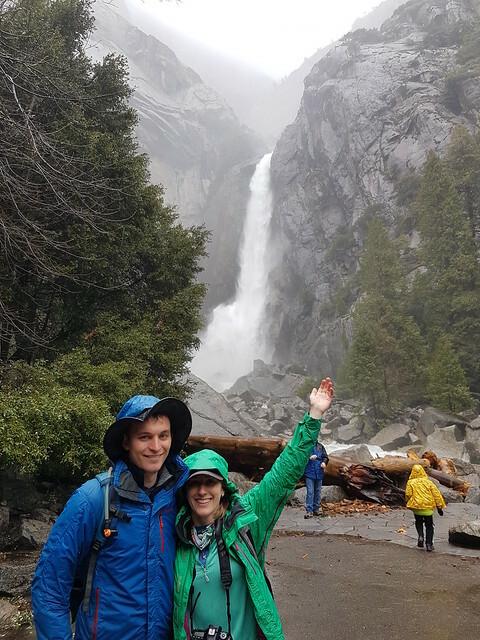 While the trail is available to hike year-round it really comes into its own in the spring, where the snow run-off from the mountains supercharges the waterfalls in the valley. In fact, it supercharges everything, transforming creeks and streams into raging rivers, and grasslands into flood zones. With torrential rain predicted for the whole day, we huddled in our waterproofs and took especial care when crossing the new ‘rivers’. And dreamed of hot coffee and cake waiting for us at the end of the trail. 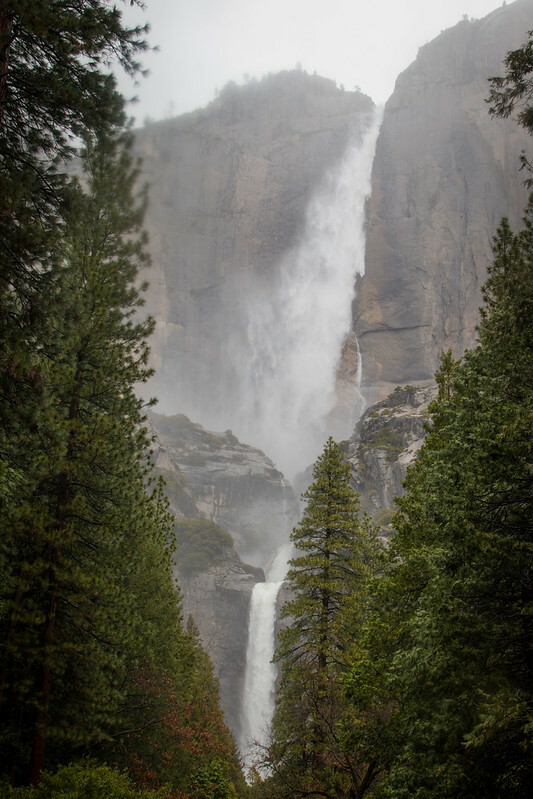 The trail begins at the Yosemite Falls and Lower Yosemite Falls, the highest waterfall in the park and a dramatic start to the trail. It is impossible to stand too close to the falls without getting soaked! 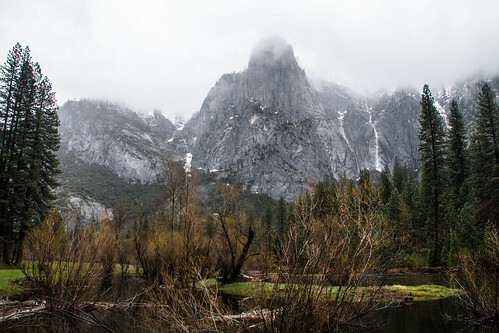 After skirting through Camp 4, the Valley Loop Trail continues past Eagle Peak and the Three Brothers, which were shrouded in mist. 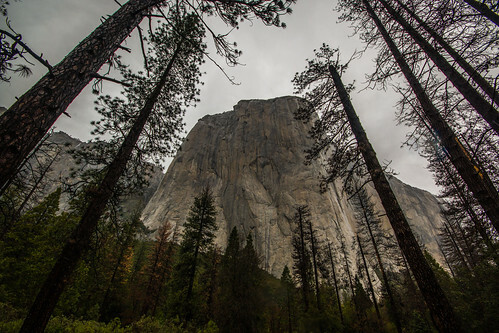 However the most impressive on the trail is the sight of El Capitan. 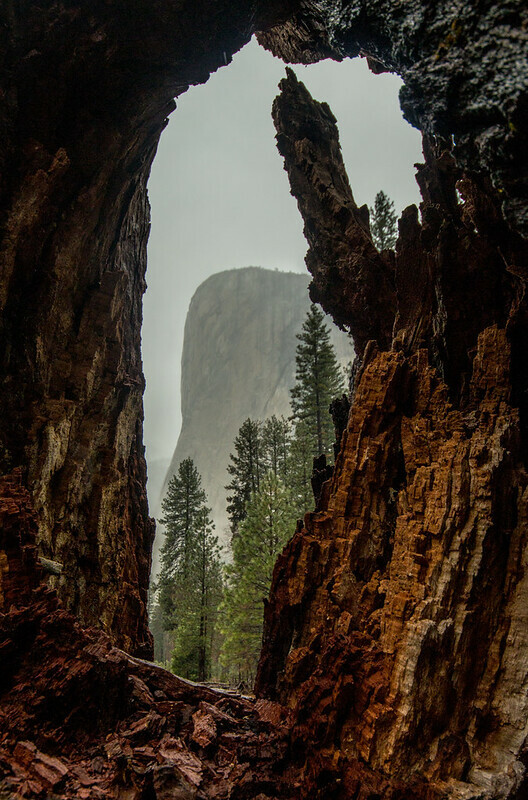 It looms over the valley, where its unique rock face can be seen for miles around. For years I have followed the exploits of climbers and BASE jumpers around the world and their attempts to summit its face. Seeing it in person only makes you realise how challenging the routes are, and the extraordinary ability and endurance of those that achieve the summit. The trail finally loops back over the Pohono Bridge, an incongruous stone bridge that has been transporting people around the park since 1928. 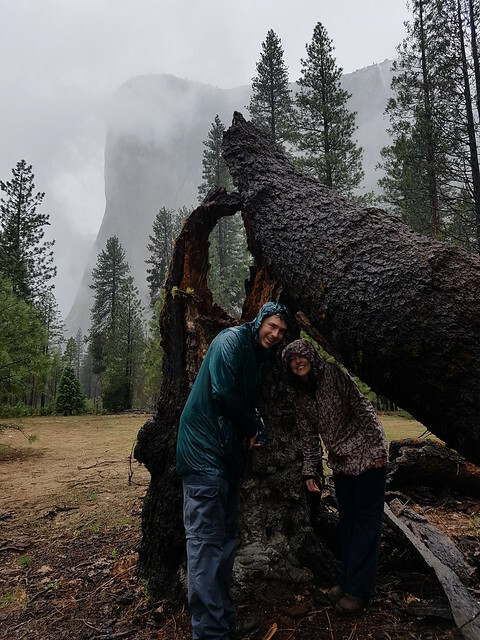 The second side of the trail features more breathtaking Yosemite scenery: tumbling waterfalls, thick forests, and boulder gardens. Shorty after the trail turns back on itself hikers are treated to a peek of Bridalveil Fall, before following the main road back around towards the finish line. 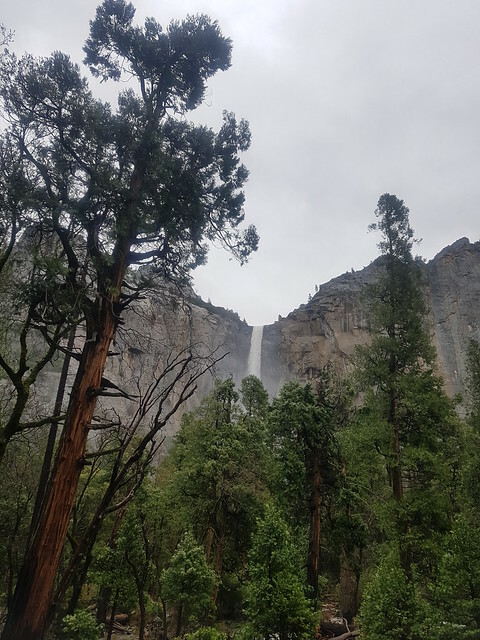 The Ahwahneechee tribe that once lived in Yosemite believed that Bridalveil Fall was home to a spirit called Pohono, who guarded the entrance of the valley. 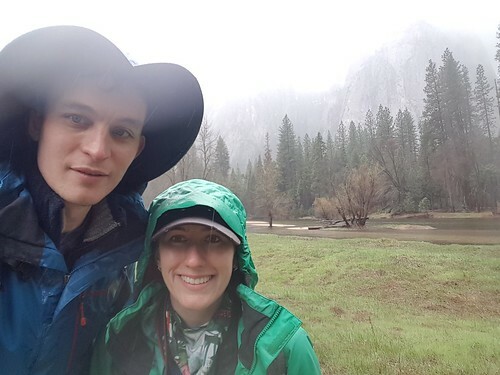 As the old tale goes, visitors leaving Yosemite Valley should not look directly at Bridalveil Fall, or they would be cursed. With a parting view as stunning as Bridalveil at sunset though, you might find yourself taking your chances with ol’ Pohono. 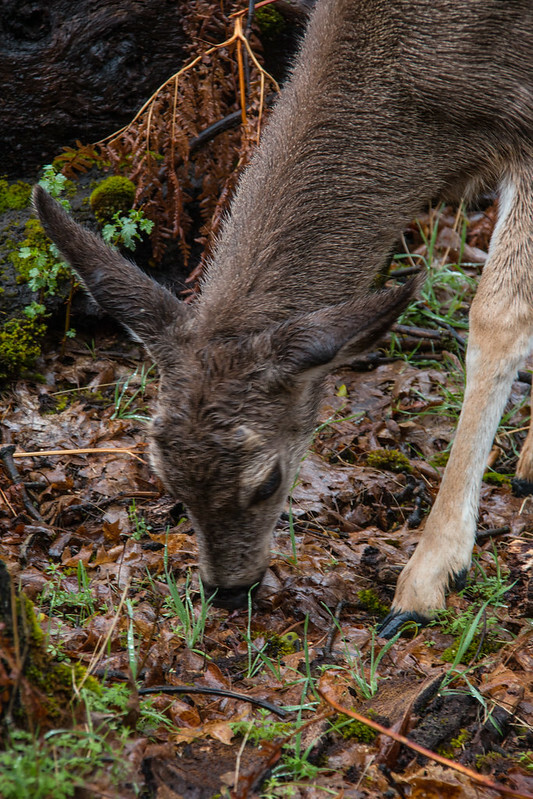 A word of warning to hikers – cantankerous spirits aren’t the only obstacles you have to face on the Yosemite Valley Loop Trail. 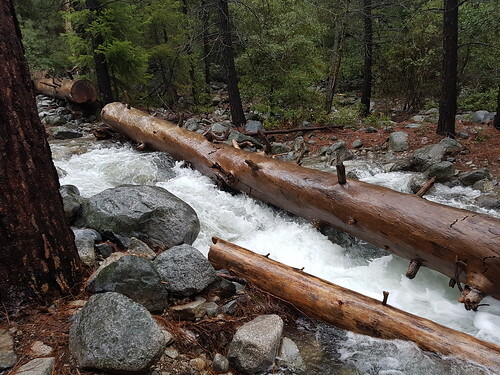 The route is prone to flooding in the spring, where usually safe crossings over the smallest trickling stream can flood and turn into potentially perilous situations. 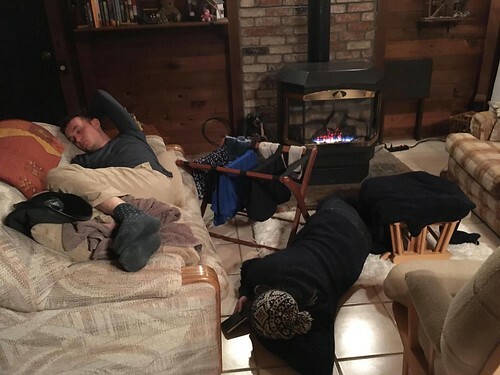 Make sure you pack a good waterproof and snacks before heading out, and make sure you have a good dinner and fire to go home to for maximum cosiness and recovery- the trail will take it out of you!